The College Cantina | The twenty-something's guide to good food. The twenty-something's guide to good food. Perhaps you’re not that hungry, and all your stomach is hankering for is a quick bite, or snack, to satisfy your palette. The best go-to place that I suggest for ice cream, candy, chocolates and more is Aunt Nina’s Sweets & Treats in Crest Hill. Located just 10 minutes away from Lewis’ main campus, Sweets & Treats serves up a bevy snack-related foods and desserts that’ll satisfy any twenty-something’s cravings. Though their prices may be out of range for some, their homemade chocolates and bulk candy are definitely worth it. When I spoke with co-owner, Christina Newcomb, she explained that their homemade chocolates are $20.99 per pound, and is much less cheaper than many other, well-known, chocolate makers like Fannie May. Their bulk candy, on the other hand, are $9.99 per pound, and these candies include M&M’s, gummy bears, saltwater taffy, among others, which she explained can be mixed and matched by patrons. What really stood out for me was their wall of homemade popcorn, with flavors ranging from your typical caramel and cheddar, to unconventional flavors like ketchup, birthday cake and my personal favorite, nacho cheese. The usual bag of popcorn that I get is under $5, which is perfect for anyone looking for a snack. With other “sweets & treats” like ice cream and homemade pastries, Aunt Nina’s Sweets & Treats is definitely worth checking out. Sometimes, there’s just not enough funds in my wallet for lunch on days when I get home from class. Even worse, as I sometimes desperately rummage through the pantry and the fridge, all that’s left is a bottle of ketchup, a few eggs, a bottle of Moscato and the staple food amongst our age group: Ramen noodle. Don’t get me wrong, I love a bowl of Ramen, especially on days when I’m feeling really sick. But on days when my stomach’s growling louder than usually does, I need my Ramen to have some substance. I mean, when you look at it, all you get is noodles and chicken flavoring, which eventually turns into broth once you add the boiling water. For those days when I need a little protein with my Ramen, I add an egg into the boiling water. Now, before you click the “X” button on top of the browser in disgust, think of it: You’ve got a chicken flavored Ramen, what better way to add substance to it than by adding a (somewhat) related food, an egg? Also, if you’ve ever had Chinese egg drop soup, it’s pretty much the same consistency and taste. I should note, however, that if you want to try this recipe, merely adding hot water won’t thoroughly cook the Ramen and the egg. I suggest following the stove top cooking directions to make sure that your bowl of Ramen and egg is not only cooked thoroughly, but tastes delicious as well. Sorry for the lull in posts, but nonetheless, I’m back with another suggestion for you hungry hounds. We all know that pizza’s pretty much the staple food among every college student’s diet. Though highly celebrated amongst our age group, it’s also linked to one of the most debated topics: Who has the best pizza? Being a part of The Flyer newspaper, our adviser brings us some of the best pizza I’ve tasted during our late production nights. Beggar’s Pizza, for example, lives up to their promise of “laying it on thick” by having a solid layer of cheese and topping, while Chicagoland favorite, Aurelio’s Pizza, has one of the tastiest, sweetest pizza sauces that’s ever hit my palette. Fat Ricky's pizza by the slice at $3.50. Nom, nom. Though it’s thin crust, what’s great about their pizza by the slice is that diners have the option of choosing between cheese, pepperoni or their sweet, homemade Italian sausage, which I highly recommend. What’s also great is the portion they come in, which (judging by the photo above) clearly spills over the plate. Offering other dishes like deep dish pizza (which start at $10.75), burgers and pasta, and being so close to Lewis, Fat Ricky’s is definitely worth checking out. Disagree and have another local pizza place that you absolutely love? Sound off in the comments section! A good Saturday to all! Although my blog’s aim is to be a food guide for college students, I wanted to switch gears up a little bit and talk about something that’s food related (or rather Food Network related) and get off topic, if only for this one post. I wrote about this topic in The Radar for The Flyer Newspaper, and I thought it’d be fitting to write about it here as well. Anyway, I’m a big Food Network fan. I feel like my interest in cooking really took off when my cousins and I would try and cook one of Rachel Ray’s “30-Minute Meals.” We’d fail, of course, not because the food we made tasted horrible, but because those “30-Minute Meals” ended up taking us over an hour to make, especially considering our inexperience. Since then, I’ve gotten better at cooking, and I’ve come to be a big fan of other Food Network stars like Ina Garten, Dave Lieberman, Giada De Laurentiis and, a personal favorite, Paula Deen. For those unaware, a couple of things people should know about Paula Deen is that she’s very eccentric, has an infectious laugh, cooks mouth-watering country recipes and has quite the love for butter. Recently, she was seen riding the back of another Food Network host at some food and wine event in February. Since then, people have begun to Photoshop her riding other things (like butter, Snooki’s hair bump and Bambi) in the novelty website, Paula Deen Riding Things. Although the site’s name seems a bit suggestive, it’s definitely far from it! It’s more of an homage (albeit comedic) to one of the most lovable, down-to-earth and skilled chefs out there today. Hello, and welcome to The College Cantina blog! I’m Carlo and I’m a student at Lewis University majoring in journalism. The first restaurant that I highly recommend (which happens to also have “Cantina” in its name) is Front Street Cantina in Plainfield. 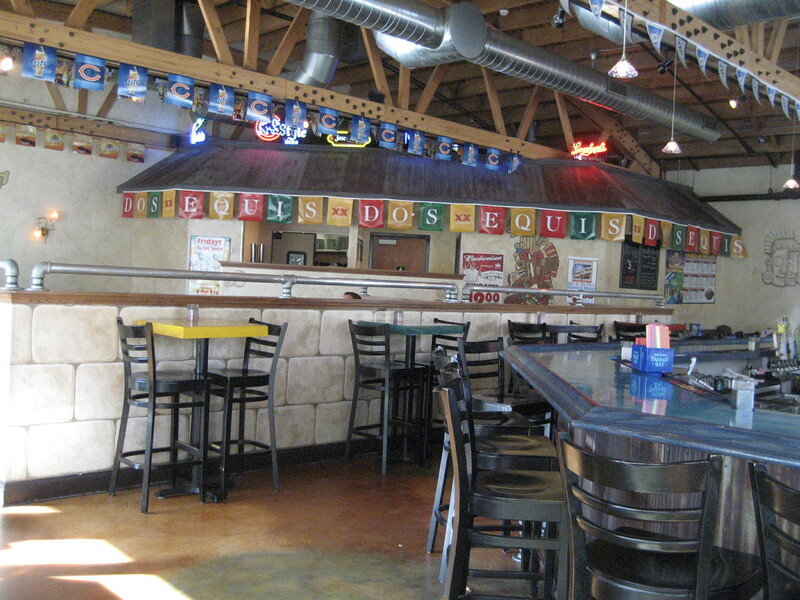 Located off the downtown main strip, Frontstreet Cantina is a small, Mexican themed restaurant that serves amazing, delicious authentic Mexican food. What I absolutely love about them is that their food isn’t greasy and that they’re very generous with their portions. Patrons are often served free, warm tortilla chips with a heaping amount of fresh, chunky salsa dip as an appetizer. Their lunch and dinner platters are always served with black beans and the tastiest Mexican rice I’ve tasted outside of the city. Students with only a Hamilton in their wallet can get a lot out of Front Street Cantina’s Lunch Specials Menu, because everything’s under 10 bucks! Cheese lovers out there (and a personal favorite of mine) should try the chimichanga. The chimichanga is basically a filling, deep fried burrito with mozzarella and your choice of meat inside. With a very decorative interior, and located right across from a park, I’d say that Front Street Cantina in Plainfield is worth the visit.